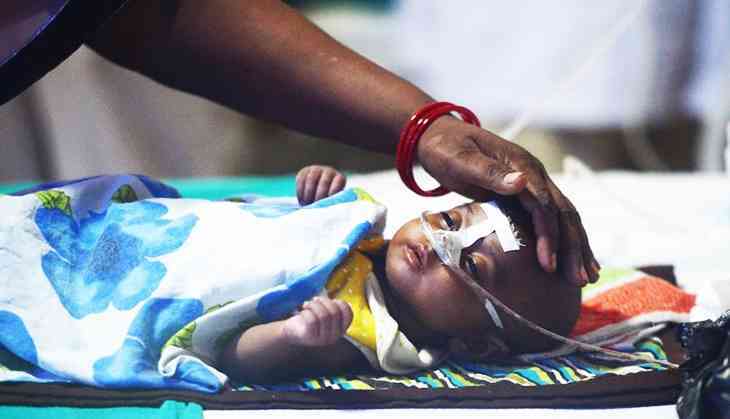 A fortnight after a disruption of oxygen supply led to the deaths of 32 children at Gorakhpur’s Baba Raghav Das Medical College Medical College, death has claimed 61 more children at the infamous college over the last 72 hours. Horrifyingly, a total of 290 children have died at the medical college in Uttar Pradesh in the month of August alone, with there still being one day to go in the month. Of them, 77 of the children died in the encephalitis ward. Since January this year alone, there have been 1,250 deaths at the hospital. A doctors’ panel constituted by the Central government said that number of deaths - 200 - in July 2017 is lower than the 292 deaths in July last year. Nine children died on 9 August while 23 more died on 10 August, the day when the oxygen crisis was at its peak. Another seven infants died on 11 August, pushing the toll to 39 in less than 72 hours as the hospital staff struggled to manage the supply of liquid oxygen. To avoid post-mortem examination, the bodies were handed over to their parents who were then shooed off. Dr Rajiv Mishra and his wife Dr Purnima Mishra were arrested from Kanpur by the Special Task Force of Uttar Pradesh police on 29 August. Seven other accused, including Dr Kafeel, the in-charge of Ward 100, from where maximum fatalities were reported, are still absconding. He said that some of the patients reaching the hospital were in such a critical condition that they barely last half-an-hour or so. Of the casualties, 25 took place in the neo-natal intensive care unit, 25 in the general paediatric ward and 11 in the encephalitis ward. The principal confirmed seven deaths due to encephalitis, a scourge in the region, in last 48 hours as he sought to portray August as an accursed month. Although shortage of oxygen was said to be the cause of death, the Yogi Adityanath government-instituted inquiry is silent on the exact cause of deaths. The inquiry report submitted by the state’s chief secretary fixed responsibilities on nine accused and filed cases against them under different sections of the Indian Penal Code. Additional chief secretary Anita Bhatnagar Jain was also divested of medical education department. Many of the recent deaths have been attributed to the lack of proper care, the government had so far not come up with a statement to explain the high casualty especially when encephalitis deaths were relatively low. Siddharth Nath Singh, the state’s health minister, stated on 12 August that an average of seven deaths per day at the Gorakhpur hospital is normal. The BRD Medical College, being a referral hospital, gets patients from primary health centres and their condition worsens by the time they reached the hospital, he said. Explaining the heavy footfall, he said that the hospital gets patients from Gorakhpur and other adjoining districts, but also from Bihar and Nepal. About August being a month of high fatalities, Singh had said at a press conference that 587 deaths were recorded in the paediatric wing of the BRD Medical College in the same month last year, which worked out to an average of 20 deaths per day. He said that the average casualty figure was 19 in August 2014 and 22 in 2015. Opposition parties have criticised the government for being high on promises and low on delivery. “Oxygen may not have been responsible for the recent deaths, but they show that the situation has not changed after the chief minister’s visit following the August 10-11 tragedy,” said Samajwadi Party spokesman Anurag Bhadauria.